For some reason, mountain bikes have become commoditised and ubiquitous in the UK. It doesn’t really make sense, because they aren’t especially well suited to any task except off-road cycling—and that’s something that, I am sure, only a minority of owners actually do. Most of the time, they are ridden on the road, where their knobbly tyres make pedalling much harder, while the lack of mudguards and chain protection sartorially endanger the rider. And who would ever need 21 gears?! Two or three is surely more than enough considering the versatility of human legs. It wasn’t until I started using a mama-chari—granny bike—in Japan that I realised how much better they were for everyday use: slick tyres make pedalling effortless; a basket facilitates shopping; a low crossbar means it’s easier to get on and off. There are usually no gears at all: if they exist, they are of the reliable in-hub variety. There’s a reason why this kind of vehicle predominates in places where cycles are widely used: it’s simply better suited to the task. The Japanese have the mama-chari, the Dutch the omafiets, and I’m sure that other cycling cities have their own version. So why can’t we buy them in England any more? Apparently, everyone thinks mountain bikes are cooler. Perhaps they are. They look more rugged and manly and technological with their chunky tyres, oversized frames, and complete lack of practical features. Granny bikes seem risible by comparison, I suppose. I used to think so. With the clement skies and longer daylight of the summer months, I resolved to find a cycle. 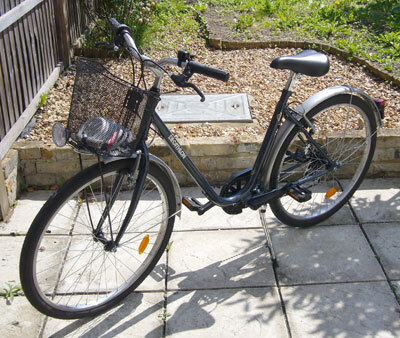 I visited second-hand cycle shops only to discover that they were challenging common sense with their prices (£150 for a rusty heap in its third or fourth decade of disrepair?!). I resolved myself to defeat. In the local branch of French sport-hypermarché Decathlon, however, I finally found what I was looking for. Slick tyres, mudguards, built-in dynamo lights, step-through frame, and even a front basket. In case you were beginning to wonder, no, it’s not pink! It’s a sober navy and silver colour scheme. Alas, it has the less-reliable but common derailleur speed system, although with a restrained five speeds. At £100, it was acceptably priced (consider that it is over £20 for a week’s worth of Tube travel in our kleptocratic capital city). I bought it. I’ve been using my new cycle almost daily for the past three weeks, and I’m very happy with it. Although it’s a slight hassle to drag it through the terraced house twice a day, it’s pretty secure in the back garden. It’s the same situation at work, too: the cycle parking is in an inner courtyard. It’s secure, but tricky to get through there. I’m getting better at that. The stand was set too short and it fell over the other day, denting the rear mudguard, but my panel-beating skills restored it to approximately the correct shape, after which I adjusted the stand to a better length. Granny bikes are great. As well as being comfortable and practical, I suspect that they have a lower resale value and are therefore less enticing for thieves. Best of all for me, though, is the image. It communicates the message I want to project: exactly the opposite of the lycra-clad enthusiasts. This is the cycle as a regular means of transport, one that doesn’t require special attire or athletic prowess. Cycling for the common man—or granny.